Following the example of Pope Francis during his first official trip outside the Vatican to the tiny Sicilian island of Lampedusa in July 2013, Cardinal Sean O’Malley and a group of American bishops placed a wreath at the border wall in Nogales, Arizona, April 1 to honor the thousands of desperate people who have died trying to cross the border to find a better life in the United States. Using the story of the Good Samaritan, Cardinal O’Malley described Christ’s model for the proper treatment of a neighbor and underscored the parable’s moral tenet. “We come here today to be a neighbor and to find a neighbor,” the cardinal said. Bishop Eusebio Elizondo, auxiliary bishop of Seattle, reiterated that as a “moral matter, our nation can no longer employ an immigration system that divides families and denies basic due process protections to our fellow human beings.” Members of this religious delegation have urged Congress to move quickly to fix this broken system and to pass comprehensive immigration reform. In addition, the bishops also called for the Obama administration to stop deportations of immigrants who are not a threat to the nation and have families living in the United States. There are approximately 11 million undocumented persons living in the United States. Since 2008 almost 8 million people have been deported, and more than a half million are in immigration detention centers. Perhaps the most pressing problem that the bishops are trying to solve is the plight of the “dreamers.” Last year about 25,000 children crossed the border unaccompanied by an adult. Due to current immigration policies thousands of families are separated. Most undocumented immigrants living in the United States are exploited and lack access to basic human services. They live in the shadows. It is cruel to deny these children any legal status. They have been here for almost their entire lives. They are essentially Americans in every way. We have to welcome them as citizens and give them the opportunities to be successful in this country. A just and compassionate society cannot punish innocent children. Several hundred people attended the Mass at the border concelebrated by a delegation of bishops from the United States Conference of Catholic Bishops’ Committee on Migration and even bishops from Mexico. During the liturgy a few dozen migrants peered through the border fence from Mexico to participate in the Mass. Cardinal O’Malley and Bishop Kicanas of Tucson offered holy Communion through holes in the fence to those in Mexico, who broke down in tears. With this Mass on the border the bishops have demonstrated a dramatic effort to call attention to the dignity and needs of the poorest among us and have called us to advocate for immigration reform. This issue is not just a human right, but a moral duty and a truly Christian act of love of God and neighbor. So, we ask La Virgen de Guadalupe to lead us all to Jesus, her Son, in order to learn how to love God and neighbor more, and not be indifferent to the needs of our brothers and sisters. 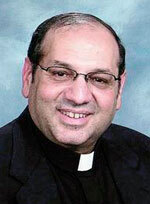 Father Gus Puleo is pastor of St. Patrick Parish in Norristown.